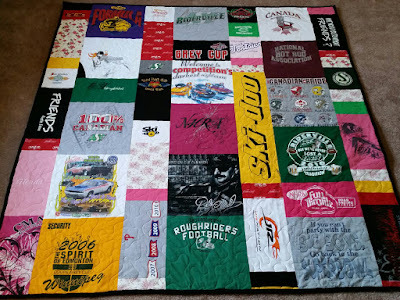 To make sure that your t-shirt quilt illustrates your flair perfectly! They have many different sizes and shape blocks that gives it a modern look. Sizes range from lap quilt (68 inch by 73 inch) to King size! 20-25 t-shirts are needed for lap quilt. 60 shirts for King size. They have 1 rectangle and 2 squares per block and there are 20 blocks. It is a mix of the Modern and Traditional style shown above. 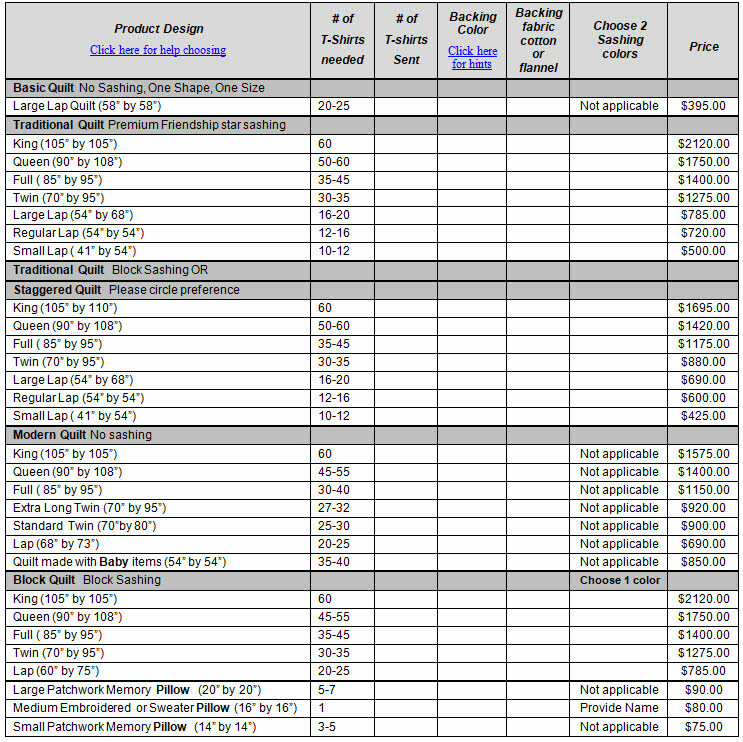 Sizes ranges from lap quilt (60 inch by 75 inch) to King size. 15-18 t-shirts are needed for lap quilt, 60 shirts for King. These quilts contains premier friendship star sashing (fabric around the t-shirts) that gives the quilt a premier traditional look. This sashing comes in a variety of colors-you get to choose! Sizes range from small lap size (41 inch by 54 inch) to King size! 12-15 t-shirts are needed for small lap quilt, 60 shirts for King size. Backed with 100% cotton or super soft flannel in the color of your choice. These quilts contains block sashing (fabric around the t-shirts) that gives the quilt a traditional look. This style works well if you have t-shirts with large graphics. 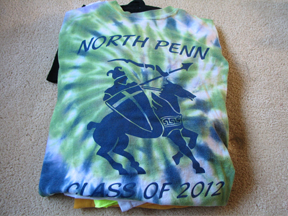 This quilt contains NO sashing (fabric around the t-shirts). All blocks are the same size. 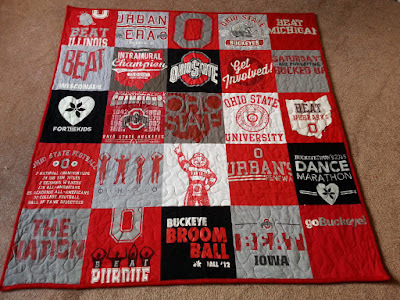 20-25 t-shirts are needed for this quilt. This style works well if you have t-shirts with large graphics and are on a strict budget. These quilts contains sashing (fabric around the t-shirts) and the blocks are placed in a staggered fashion. Can use light denim for the sashing! 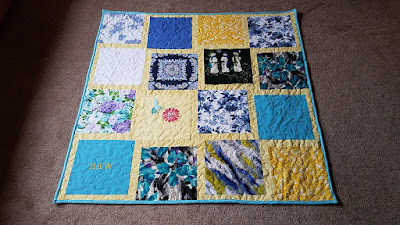 Click here if interested in a handkerchief quilt! Or here if interested in a tie quilt!